My name is Kim. I am married to my best friend, Steve. I spent the first 12 years of my life growing up in Philadelphia in the 70s and early 80s before moving to Michigan when my parents decided it was time for a (drastic) change. I went to high school in small-town USA and only stayed at college for (nearly) one semester. I traveled several states singing Southern Gospel music and doing some writing and vocal coaching along the way. I worked in retail for a decade. I moved to the second largest city in Michigan in my late 20s. 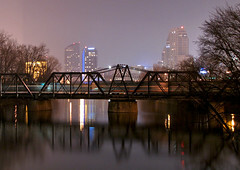 I found Grand Rapids to be the perfect blend of urban and rural for my tastes. As my 40s near, it seems I am at last ready to openly explore those areas of life that need tweaking, ok – overhauling. This blog is intended to be my attempt at putting all of the internal conversation on the screen and create an environment where healthy dialog can abound! I think this may prove to be easier than the real desire of my heart…to take the dialog and turn it into real life change. Aha! Kim! A way to tell you that your blog entry about JG was beautiful. Thank you for sharing your words with me on my blog (Lessons From Teachers and Twits); it really meant a lot to me. You must prefer to not get comments. Sorry. I had to tell you that your blog is a beautiful tribute and memorial to your *lost* friend. Renee, thanks for popping in! I LOVE comments but am so brand new to blogging…maybe I need to work on my page layout! My friend JG was a wonderful woman and dearly missed. She just passed away last week. I am thankful for a new blogging buddy. Looking forward to future posts.